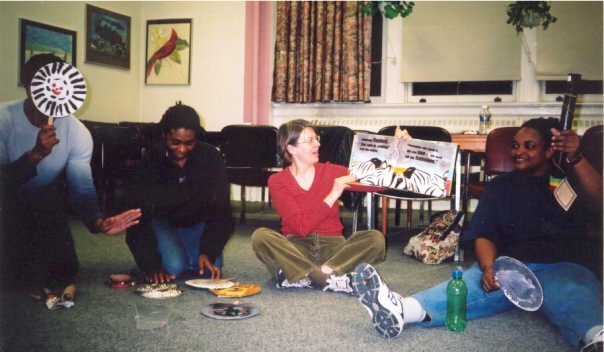 Musical Links to Literacy is a unique workshop that I created and have delivered at various conferences and workplaces for early childhood professionals since 2003. This two-hour workshop offers educators the opportunity to explore basic music concepts, and develop a repertoire of songs, rhymes and fingerplays as they learn to assemble a music circle for young children. In addition, workshop participants use a variety of picture books to connect music to early literacy experiences. Handouts are provided. At the present time I am available to deliver this workshop in and around the Greater Toronto area. For further information about costs, or to invite me to present at your conference or workplace, please e-mail me at adavies@earlychildhoodartsconnection.ca. Early Childhood Educators participate in telling a story using masks and musical instruments! This is why I keep coming back to this blog. I can not believe all the new stuff since the last time!